by Reece, Jane B.; Taylor, Martha R.; Simon, Eric J.; Dickey, Jean L.
Cutting edge information that connects biology to students#x19; lives. Campbell Biology: Concepts & Connections, Seventh Edition#x13;Go Wild! 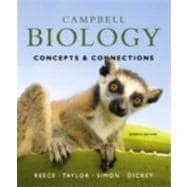 #xA0; Campbell Biology: Concepts & Connections ,Seventh Edition#x13;always accurate, always current, and always the most pedagogically innovative non-majors biology text. This bestselling text has undergone an extensive revision to make biology even more approachable with increased use of analogies, real world examples, and more conversational language. Using over 200 new MasteringBiology activities that were written by the dynamic author team, your students arrive for class prepared. The book and MasteringBiology together create the classroom experience that you imagined in your wildest dreams. Campbell Biology helped me through my biology 121 class and lab at Western KY University. The concepts were introduced in a logical fashion using illustrations and other visual learning aides, allowing me to understand key biological concepts without a scientific background. Chapter organization also made it simple to prepare and review for exams. Campbell Biology Concepts & Connections: 5 out of 5 stars based on 1 user reviews.